You learn a lot from being a contestant on Cupcake Wars. Bubba Sweets shared the valuable lessons she gained from her participation on Cupcake Wars and the importance of time management and organization to help her run a successful business. Being a long-time fan of Cambro containers, Bubba soon discovered that Cambro also offered a shelving solution designed specifically with the cost-conscious, independent operator in mind. Shelving that would help her improve efficiencies during prep and clean-up, allowing her to dedicate more time to create amazing cupcakes that keep her customers coming back for more. 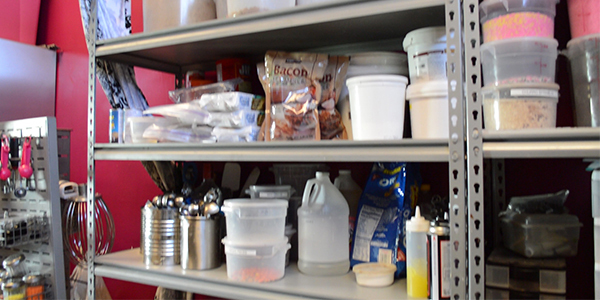 Bubba decided it was time for a shelving overhaul and Camshelving® Basics became the ideal solution for her business. The industrial shelving Bubba Sweets was previously operating with was only doing half the job. They quickly realized that shelving purchased from a home improvement store had its limitations and was not going to be able to support the needs of their growing business. They were in need of a solution that would allow them: increase their storage capacity, make it easier to clean and rinse off spills and also offer them the flexibility to adjust shelf levels as needed for different size packages and also facilitate storage for their flour and sugar bins without the heavy lifting. A kitchen should be set-up for maximum cost savings, labor efficiency, food safety and functionality no matter the size of operation or the budget and Basics helped Bubba Sweets achieve this and so much more! Great story. Glad to hear everything went well for Bubba. 🙂 Alot of the time, it seems only business owners understand just how important space is. Getting the righ storage and shelving solutions can really make all the difference in terms of organisation and efficiency.